LIGNA Preview offers a sneak peak at innovation. 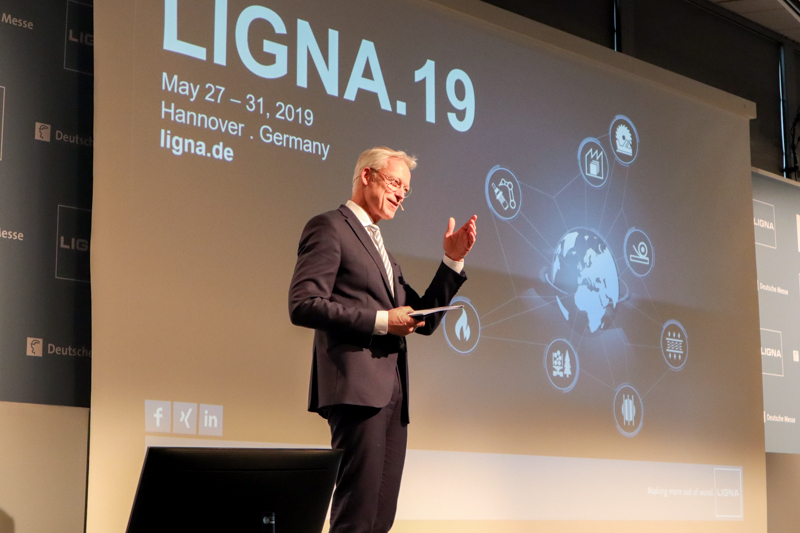 Dozens of journalists from around the world gathered in Hannover on Feb. 5, for a first look at LIGNA 2019. The LIGNA Preview event gave an early sneak peak at some of the innovations that will be showcased at LIGNA this May as more than 1,500 companies will gather in Hannover, Germany to showcase the future of the woodworking and timber processing industries. Whether it's about digitization, automation, IoT platforms or collaborative systems, LIGNA is where innovations are shown for the first time – and on an unrivalled scale. 130,000 square meters (nearly 1.4 million square feet) is the total net display area that will be occupied by exhibition stands featuring the latest woodworking and timber processing plant, machinery and tools. "From 27 to 31 May 2019, exhibitors from over 50 countries will gather here at the Hannover Exhibition Centre to showcase state-of-the-art processing solutions, applications and concepts for the entire forestry & wood industry. The presence of all the world's leading technology providers will make Hannover the global hotspot for the wood-based industries. No other fair compares in terms of international appeal", said Dr. Andreas Gaucho, managing board member at Deutsche Messe, during the LIGNA Preview press conference. "Once again in 2019, LIGNA will serve as the industry's showcase of choice for unveiling their innovations, with many exhibitors timing their development cycles to coincide with the show's staging every two years." Visitors can expect to see innovations across all display categories, from forestry technology, furniture and window manufacturing, through to tooling systems and surface technology. They will also see live demonstrations of fully functional furniture production plants, learn about IoT platforms for Industry 4.0 plants and the latest R&D projects, and be able to participate at networking events throughout the show. Gruchow said one of the big challenges is the ever greater trend to product individualization – a trend that is putting pressure on manufacturers to deliver customized products at least as quickly, profitably and efficiently as with series production. It's these sorts of challenges for which LIGNA exhibitors will be presenting solutions. LIGNA 2019 has three focus themes: "Integrated Woodworking – Customized Solutions", "Smart Surface Technology" and "Access to Resources and Technology". The latter is also the keynote theme of the Wood Industry Summit. In the wood industry, there is keen interest in IoT application scenarios, such as condition monitoring and predictive maintenance, as a means of further boosting production plant efficiency. In such scenarios, humans remain an integral part of the production process but are supported by cyber-physical assistance systems, such as collaborative robots, automated guided vehicles and smart worker support technologies. The trend is thus towards hybrid human-machine production systems in which the product is inextricably linked to the production plant and the humans who operate it. "Visitors to the next LIGNA will gain captivating insights into what the future has in store for the furniture and woodworking industries", Gruchow said. Themed "Smart Surface Technology", the surface finishing exhibits at LIGNA 2019 will span all the intelligent processing solutions needed to cater for today's surging demand for haptic, matt and reflective surfaces. That's digital printing and decorative gravure printing systems, inspection systems, and the latest generation of spray coating machines, robotics systems, and much more. Here, too, digitization and automation is the key to achieving greater flexibility while keeping costs to a minimum. The full range of the latest surface technologies, applications, innovations and solutions will be on display in halls 16 and 17. Providers of technology for the forestry and/or primary wood processing industry, in particular, will have an unrivalled opportunity to tap into new growth markets at next year's Wood Industry Summit, which is themed "Access to Resources and Technology". Complete with forum, lounge and exhibition area, the summit is all about international communication and technology transfer. Its focus will be on ways of optimizing the entire forest-wood-logistics value chain – from standing trees through to final processing in the factory – as well as on protecting forests from biotic and abiotic damage, and on climate and environmentally friendly harvesting processes and the future of the forest and wood industry. Digital technologies, such as drone-based data capture systems, mobile applications, laser scanners and highly sophisticated IT programs, now span the entire forestry value chain, from forest information and integrated harvesting systems right through to modern forest management systems. And in each case, the focus is squarely on efficiency and productivity. Digitization will therefore be a prominent theme at the discussion forms and throughout the exhibits at LIGNA 2019.